Rats are some of the most common critters to invade homes in Dallas, and are some of the trickiest to catch as well. With rat infestations on the rise, it’s important to know the signs so you can catch any potential issue as early as possible. Things like scratching from inside your walls, foul odors, or droppings usually mean that it’s time to call for professional help. The rat removal experts at Critter Control® of Dallas have over three decades of experience and are standing by to help. Because rat issues are on the rise, we have developed and perfected a four step method to handling infestations. Inspect – When you set up your free consultation, we thoroughly inspect your home or business to assess how severe the infestation is, and determine where the critters are entering. Remove – Our next step is to remove the rats. We use a variety of methods to remove the rodents from your home, and will always choose the safest and most effective option for your specific situation. Repair – In addition to removing the rodents from your home, our technicians are also trained in cleanup, repair, and restoration as well. It will look like nothing ever even happened when we’re finished. Exclude – Our final step ensures that the offending critters cannot return. We seal off entry points like cracks or holes in walls, or ventilation ducts so they can’t re-enter later on. If you’ve noticed the signs of a rat infestation, give us a call immediately. 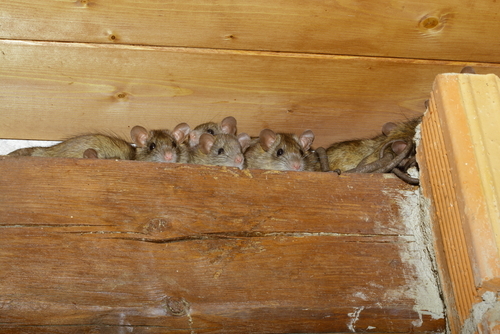 Rats reproduce quickly so the longer you wait, the more potential for damage there is. Call Critter Control® of Dallas today at 817-222-1101 to set up your free home inspection.